Winning an NBA Championship is hard, but winning three in a row is an almost inconceivably difficult task. Yet that’s just what the Los Angeles Lakers did in early 2000s, bringing the Larry O’Brien trophy back to Los Angeles in 2000, 2001 and 2002. With their trophy case filling up, the Lakers appeared to be unstoppable, but they stumbled out of the gates at the start of the 2002-03 season, rolling into Memphis for a game against the Grizzlies with a panic-inducing record of 6-12. The Lakers still had the one-two punch of Kobe Bryant and Shaquille O’Neal, and key role players like Derek Fisher, Rick Fox, Robert Horry, and Brian Shaw were still in the fold, but things just weren’t clicking for Los Angeles. 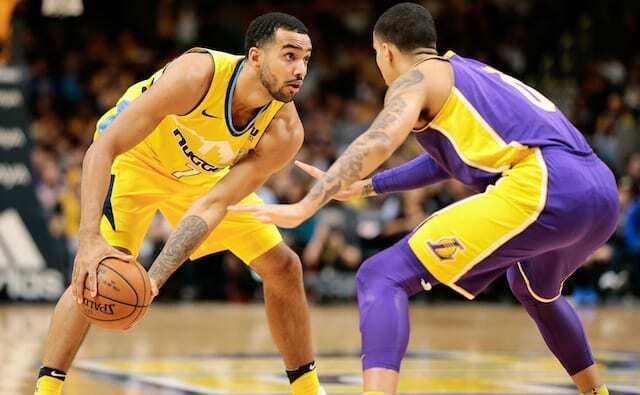 Having defeated the lowly Grizzlies, who had won two games of their own all season, just a few days prior, a rematch appeared to be what the Lakers needed to bolster their confidence. And on Dec. 3, 2002, Bryant turned in a triple-double to lead the Lakers to a 101-91 win. Future Laker Pau Gasol, then in his sophomore season, chipped in 11 points and nine boards for the Grizzlies, while reserve big man Lorenzen Wright led the team in scoring with an impressive 17 points and eight rebounds off the bench. For the Lakers, O’Neal was his usual dominant self with 28 points, nine rebounds, and a whopping seven blocks, and Mark Madsen filled in admirably for missing starter Samaki Walker, but it was Bryant who stole the show. He toyed with the Grizzlies en route to scoring 24 points, grabbing 10 rebounds, and dishing out 11 assists, while shooting 69 percent from the field and even tossed in three blocks for good measure. With the win, the Lakers started to awaken from their slumber, and after the calendar turned to 2003 they rattled off four separate winning streaks of five games or more. The dynamic duo of Bryant and O’Neal simply refused to be kept down for long. The quest for a four-peat ultimately ended when the Lakers lost to the San Antonio Spurs in the Western Conference Semifinals.